Yagan Square will be open over the weekend to celebrate the end of Bunuru, the Noongar second summer. WAM have again been asked to curate live music and entertainment for Bunuru Festival to enhance activities and bring the community together to celebrate WA’s Indigenous culture. There’s something for everyone with free, family friendly activities, indigenous dance, face painting, crafts, stories and tours alongside the live music and entertainment curated by WAM. The Festival will run from Friday 22-Sunday 24 March with the Welcome to Country ceremony formally launching the event by Walter McGuire in the Noongar language and traditional song. Bring the kids and have fun learning circus tricks and turns including stilt walking, unicycling and juggling. 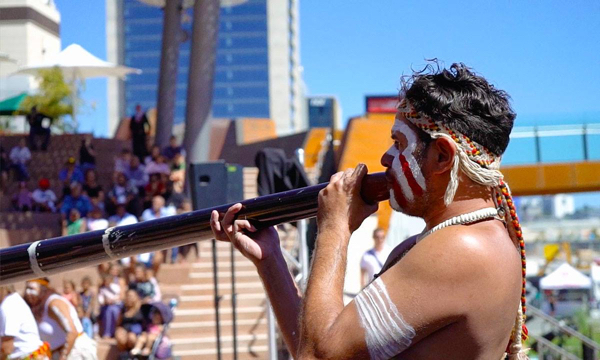 Enjoy performances from traditional Noongar dancers and even try your hand at it yourself! Even browse a selection of unique Market stalls filled with indigenous arts and crafts, delicious treats and more. Head down for lunch, stay for dinner – the food and beverage teams will be serving up a smorgasbord of eats A number of outlets serve coffee and breakfast in the morning, with the rest of the Market Hall outlets opening from 11am – 10pm on Friday and Saturday, and until 8pm on Sunday. Some outlets continue to serve drinks and eats later into the evening.